TG4, BBC Gaeilge and Northern Ireland Screen’s Irish Language Broadcast Fund are delighted to announce that they are seeking applications again for the arts documentary initiative, ‘Amharc’. The announcement was made at the Belfast Media Festival today. ‘Amharc’ was created to support the production of landmark creative films on the arts in Northern Ireland today. The initiative aims to provide film-makers with an opportunity to make distinctive, ambitious productions which will enrich BBC and TG4’s main programming schedules and which will also have a cinematic release. All artistic disciplines will be considered and whilst this initiative is focused on the creation of art in Northern Ireland, applications focusing on NI artists who are living elsewhere are also welcomed. Priority will be given to contemporary subjects but contemporary treatments of historical works will also be considered. Representatives from the ILBF, TG4 and BBC Gaeilge will be responsible for selecting the applications. Proof of ownership of the material that will be produced and a copy of agreements made with writers and other parties, if necessary. 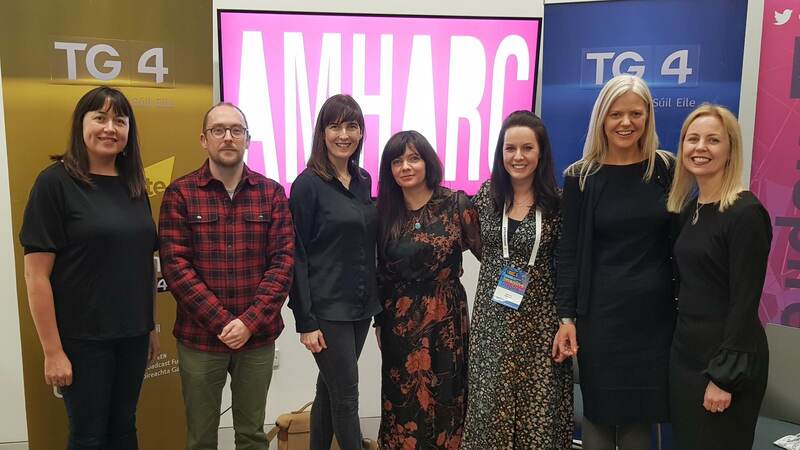 PIC: Laura Ní Cheallaigh (TG4), Damien McCann Doubleband, Karen Kirby (BBC Gaeilge), Méabh O’Hare (Léiritheoir), Edel Fox (Léiritheoir), Máire Bhreathnach (Below the Radar) & Áine Walsh (ILBF NI Screen) at the launch of ‘Amharc’ in Belfast.